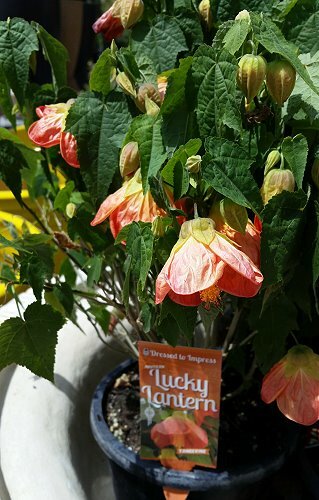 This is Abutilons – also known as Chinese lanterns – I actually have three of these here. I do not have an orange one, though. This is gorgeous but also $22. So it was a no. 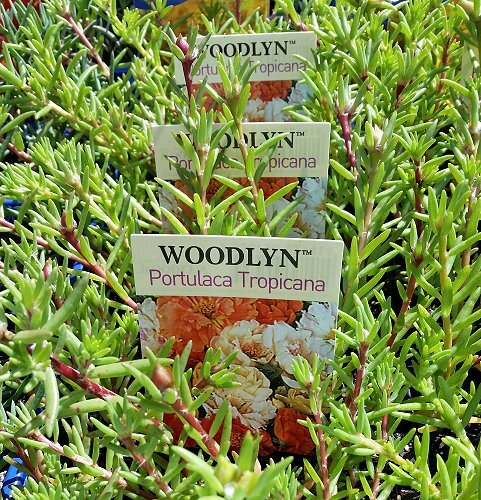 This is what I ended up buying – Portulaca Tropicana. The tag says that the flowers will be the tropical fruit colours of coconut, guava, watermelon and strawberry. This was $4.99, for 6 plants. Much more down money! Of course they are seedlings but my experience says they won’t be for long..
A couple of weeks ago, finally after a long wait, Hungry Jacks opened up within 15km of where we live. Previously, we would have to drive an hour to get to one. The place is being absolutely hammered by locals and tourists at the moment, every single day it is packed at both lunch and dinner time. We went for dinner the second day they opened and I have to say the food was really great for fast food. It was super fresh. Locally here, there are not a lot of fast food options – most of the things that are here eg chicken shops, fish and chips, hamburgers, they all usually close by 6:30 or 7pm. After that it is pretty much Mcdonalds, KFC or Oporto. There is something in Oporto which I do not react well to, so we removed that from our list of options a while ago. KFC have provided uncooked chicken on more than one occasion, so that is also a huge NO. We do have a Dominos and an Eagle Boys, neither of which we like, we gave up on them a long time ago. There are a couple of decent wood fired pizza places. We did have a great sushi place but the owners have become very unreliable. Often it will be closed when the opening hours say it will be open, sometimes with a sign on the door, sometimes with no explanation at all. Last weekend we drove to Warrawong to buy chicken in bulk. I thought the new Hungry Jacks would have organised to put a sign up on the way into town by now but we did not see one. 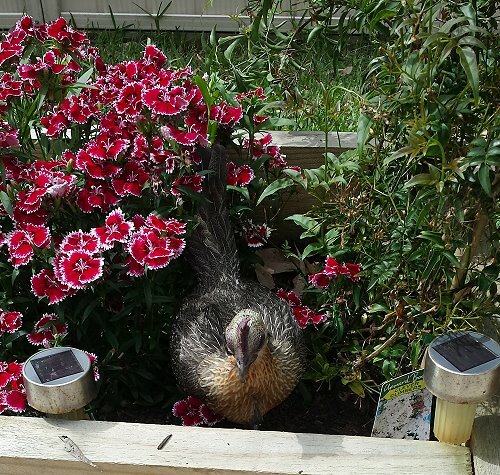 It is the first Sunday of the month, which means Garden Day here on the blog. It also means Berry Market Day, for those in Berry or perhaps Sydney who might want to drive down one Sunday. I myself have never been but I would like to go one time! So how does the garden do? 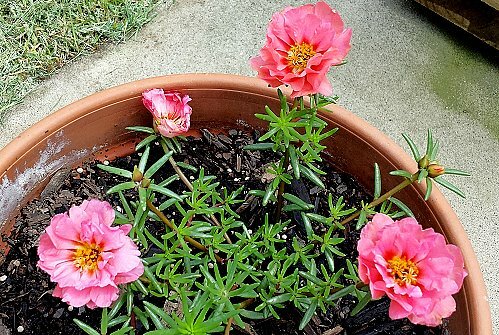 Obviously, the resilient and fantastic Portulaca are going great guns. 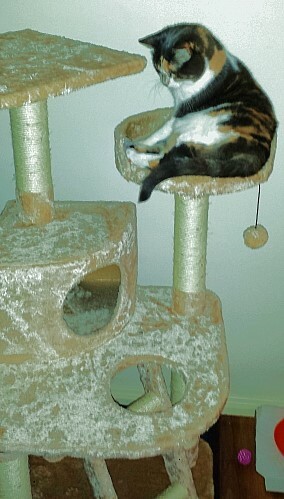 One of them decided to have an apricot and pink moment. I really love these plants. I bought some more this week, as well. 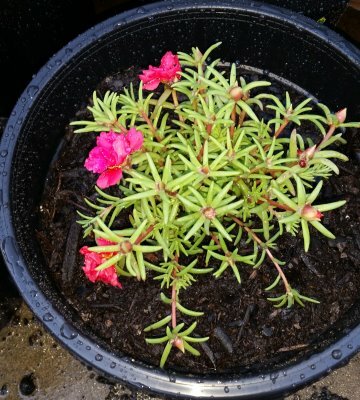 Of those, I would like to mention this portulaca, which was found at Bunnings named “Christmas Colour” and was the expensive sun of $2.84. Your local Bunnings may have some, or none at all. 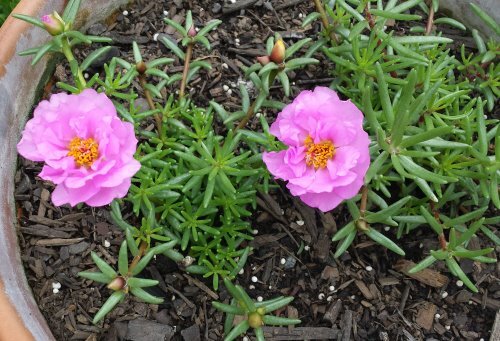 If you want to try Portulaca this is a cheap way to get a more advanced plant than the seedlings. 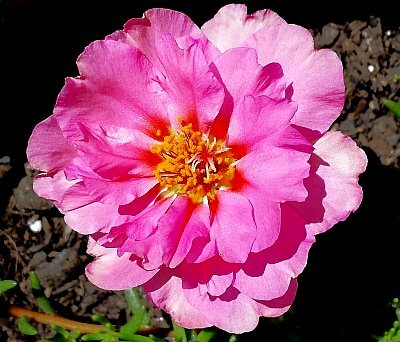 Mine has pink and red flowers, I did not see any white there, though they may have had some. 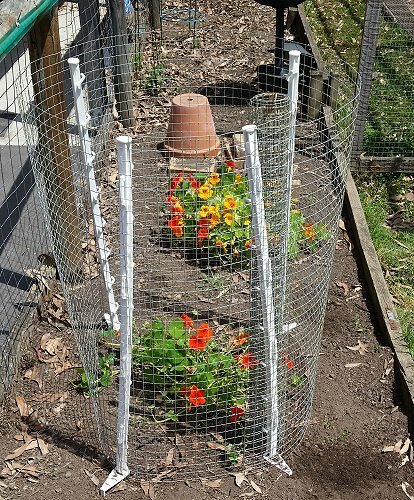 The nasturtiums which were not fenced off, as expected, went a little bit downhill, while the fenced off one was quite happy. 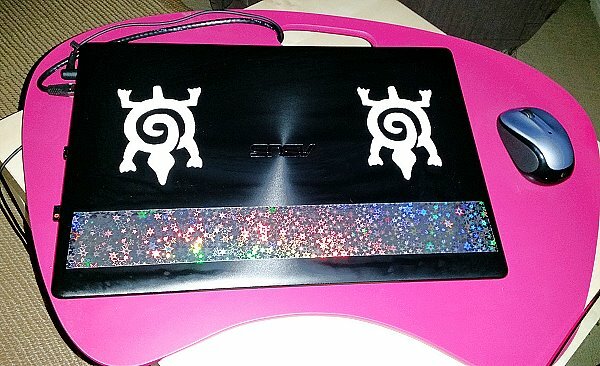 They are now both protected. 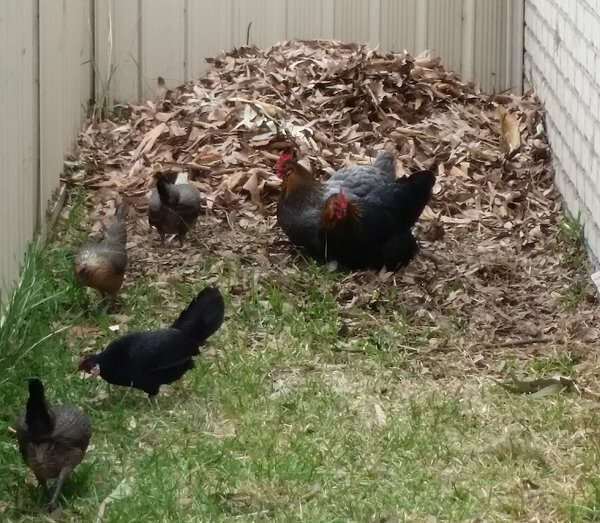 There have been a lot of leaves and bark falling from the trees – we did a big sweep up and rake last weekend, and the chook leaf pile has grown. 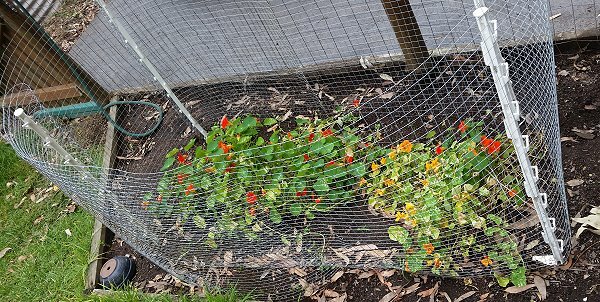 The chooks are not so sure about this – firstly, it is very noisy, compared to their already well worked over by chooks pile. Secondly, it is a lot taller. I can always tell when they are brave enough to turn over the newer scary leaves. The noise travels. The garden bed is a mixed result. The Brussels are taking off somewhat. The chard, not so much. The baby spinach did not do very well and I gave up and pulled it out. 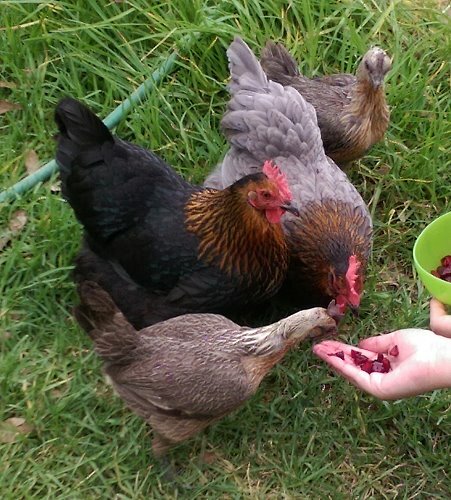 The chooks enjoyed it. I suspected one of the reasons the plants were not taking off in this planter box was the location. There is a tree next to our property which means that spot is in shade from midday or so until mid-afternoon, then the shade kicks in from other trees, and this spot did not get as much sun as these plants would like. 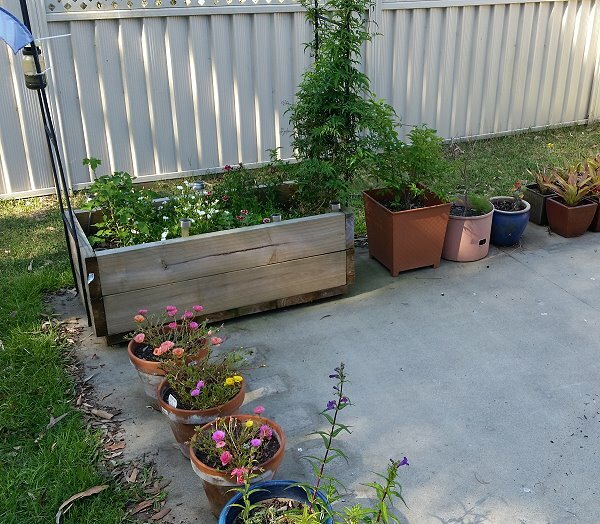 I said to The Other Half – can you move the planter box? He said no, remember when we built it, I told you to pick the spot well because it would be too heavy to move later. I said well, you really can’t go to Mars if you can’t move this planter box, with science. Pulleys and fulcrums and physics, and shiznit. I’m sure you can manage it, with science. And manage it he did, with a sack truck and a crowbar. The Other Half can now go to Mars! We’ll see how it goes with more sun. 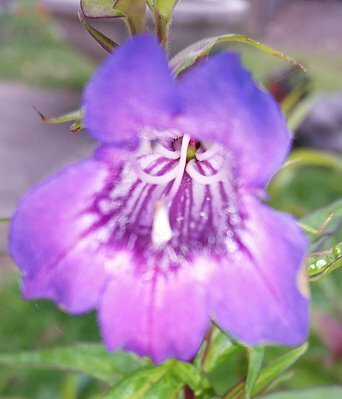 Finally an update on the Penstemon – ours is called Sour Grapes. This plant baffled me for some time, growing taller and taller but no actual buds appearing. Last week, they finally arrived. It was worth the wait. Christmas at Domayne can be very sparkly! It can also be somewhat costly. This Christmas Deer was $34.95. 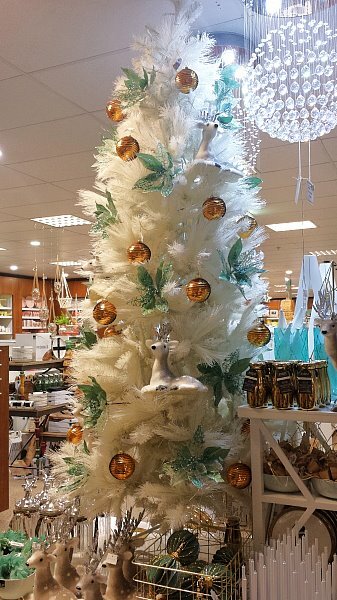 I really love the whole look, the white tree, the gold sequin balls, the sparkly pastel teal leaves. The deer jars were quite awesome. The small teal feather wreaths would be awesome on my front door. In fact my Mother who strongly dislikes Christmas almost bought one. 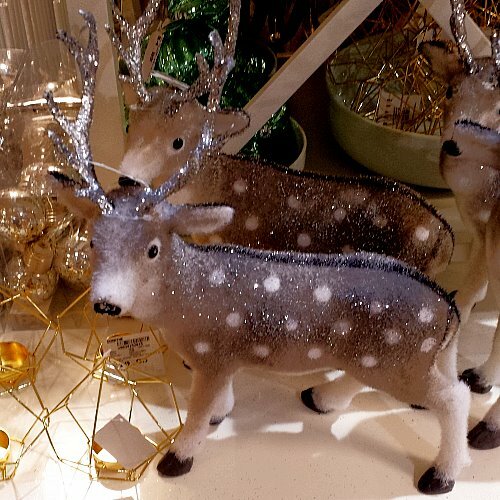 Who would not love a sparkly deer? 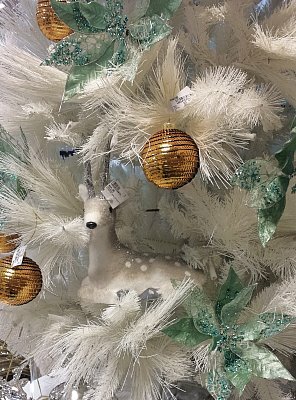 These peacock feather Swarovski crystal tree ornaments are stunning! It is worth remembering, this time next month, Christmas will be over for another year. :) Are you looking forward to Christmas? Got any big plans? 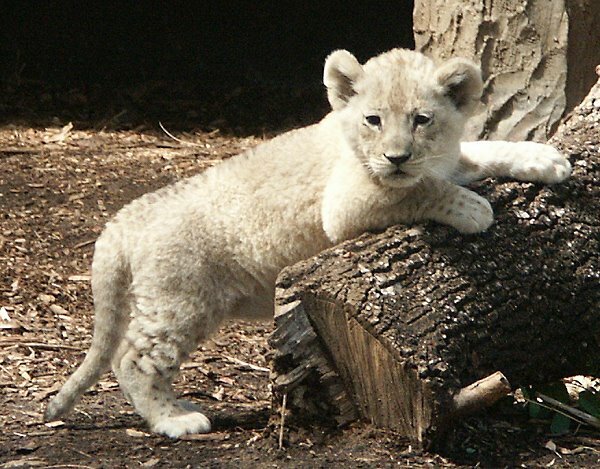 Today I am sharing some Adelaide Zoo pics from 2004 with you. 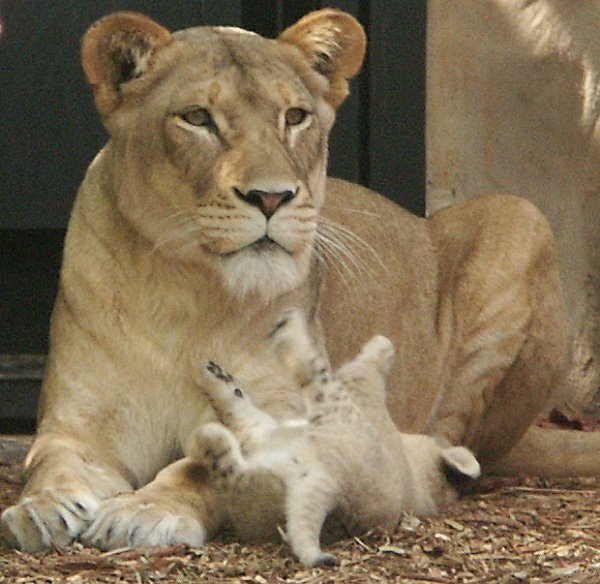 First up, some lion cubs. Look Mum, here are all my toes! 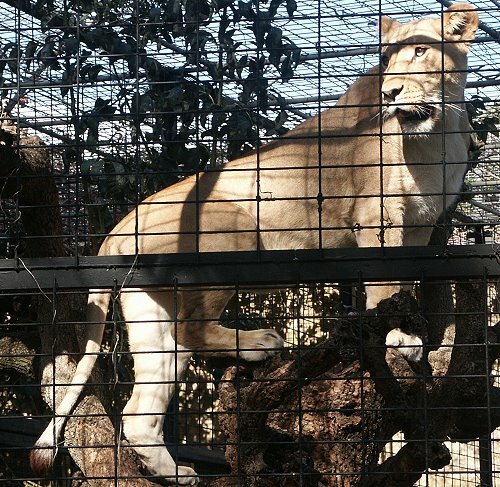 When the lion cubs were getting a lot of attention, Amani the other female lion took to tree climbing around feeding time, drawing a huge crowd to her and away from the cubs. 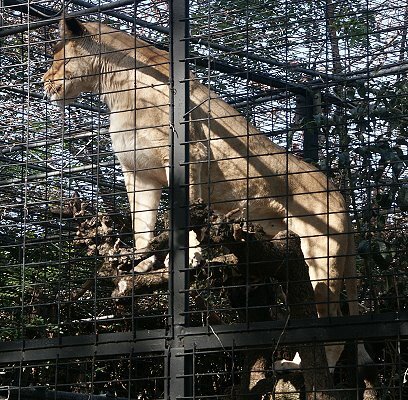 People loved to watch her..
We used to love going to the zoo every weekend, but we now live too far away from any of the zoos for regular visits. 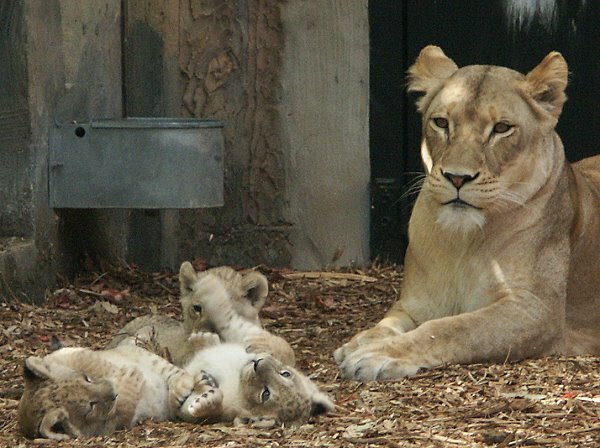 If you live anywhere near Adelaide Zoo, you might want to check out their memberships, starting from $43 for kids, $68.50 for pensioners/concession, and $99.90 for adults – plus a $25 joining fee per family. 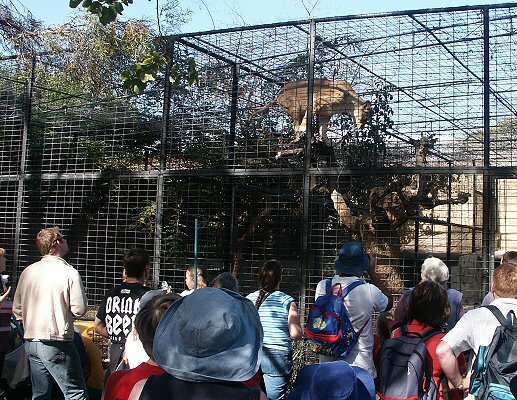 The benefits of membership are huge – the biggest one being – you can visit both Adelaide and Monarto zoos 365 days a year for free you want, plus you can visit the zoos in Melbourne, Werribee, Healesville, Taronga, Dubbo, Perth for free. 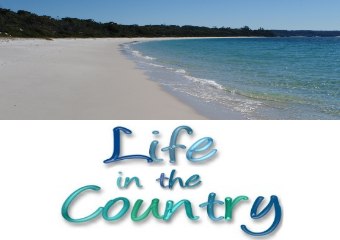 If you are planning a trip to Sydney, a single visit can be over $50 now. Melbourne Zoo and Sydney Taronga Zoo both have memberships available with the same benefits – Sydney is a little pricey. If you are looking for a rock version of Hello by Adele, look no further. Lukas Rossi has you covered. You might remember him from Rockstar Supernova. 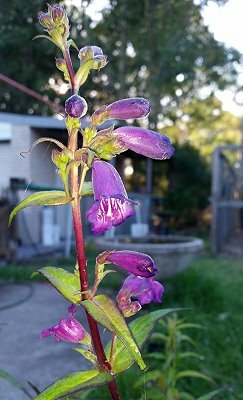 I had no idea these were not a worldwide phenomenon, until I read this post by Kathy G.
It has been a hot week here in Snoskredland. Daytime temperatures have hovered somewhere between 30-45C (86-113F) so there has been plenty of ice making going on inside, and ice melting going on in the chook pen. I’m using the ice spheres and the large square ice cubes. I’m also keeping water cold in the fridge to go into the chook pen. 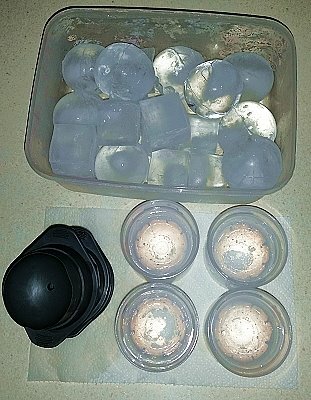 When the water is cold and a couple of ice spheres are used, even in the big heat of the day the ice lasts a good couple of hours. 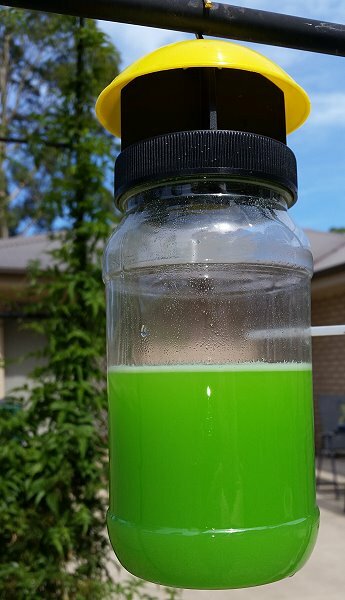 The frozen water bottle in the chook water was an experiment – I was not sure how that would go. I used water out of the tap – it was cool but not cold – and placed the frozen water bottle in it. Within a few minutes the water began to get cold. I went back to check on it an hour later and found the water was icy cold and the water inside the bottle was back to water, so I put it back in the freezer for use another day. 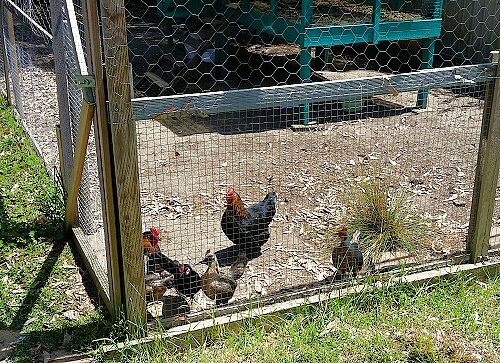 On super hot days I do not let the chooks out of the pen until the major heat of the day has passed – somewhere around 3-4pm – because left in the pen, they will spend more time dustbathing which is something that cools them down. When I let them out, they eat the grass, chase bugs, look for interesting things to eat, and run back and forth in the sun. These are not behaviours that keep the temperature down. Today I will like to share some photos of the current state of the candle shelf. The first and most obvious change – there are now 3 fake flowers in my vase. One of them is an Apricot Rose. I’m not sure what kind of flower the two purple things are, but I like them. I wrapped them together with some jewelry wire. I left the stems long because I did not want the flowers too close to the flames but the flowers have now developed a significant bend, so I might have to reconsider this. But wait, did all the colours just change? What the? 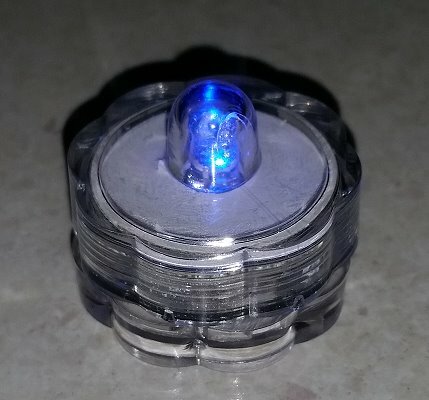 I found these submersible LED light changing tealights at a local shop. At 4.95 for 4, they were great value. 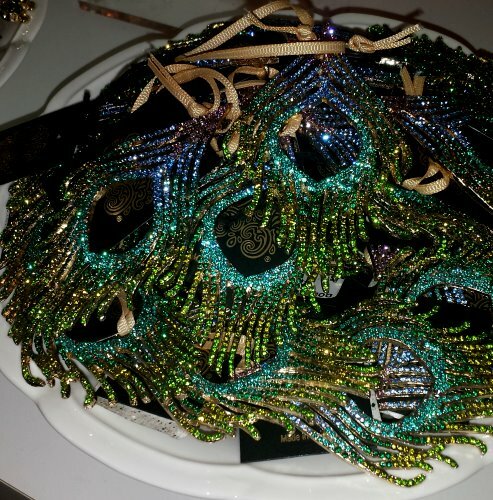 They are the kind of thing you would put in a table centerpiece for an event and they are seriously awesome. Depending on how long the batteries last in the first 4, I plan to pick up at least 2 more sets this week. When we last visited this shelf, there were 7 candle holders. Now, there are 16. That is a significant increase! But wait, Snoskred. Have you been burning 16 candles every evening? No, I’m not. That would be pretty wasteful. 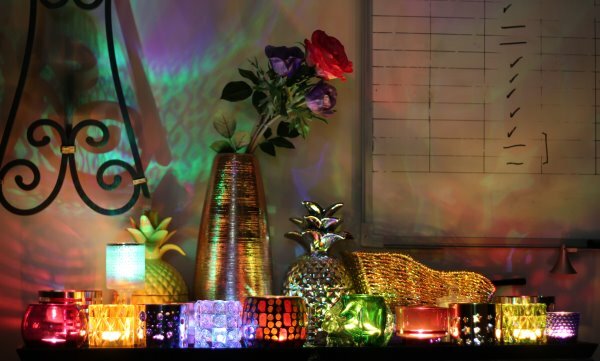 Along the front of the candle shelf there are 10 candle holders which sit on a ceramic tray from IKEA. The other 6 candle holders sit behind those. 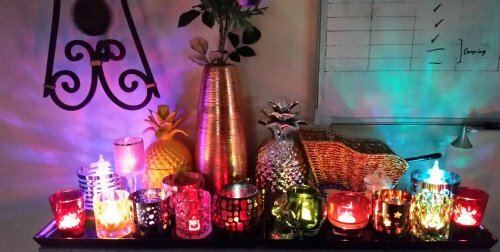 Out of the 16, there are 14 candle holders I most enjoy using..
Before I got the new LED tealights, at the start of each week, I would place one candle in each holder. Each night I would choose 4 candles to light. That would mean you got a different effect each night. On one night – either a Friday or Saturday, I would light up 12 of the candles. 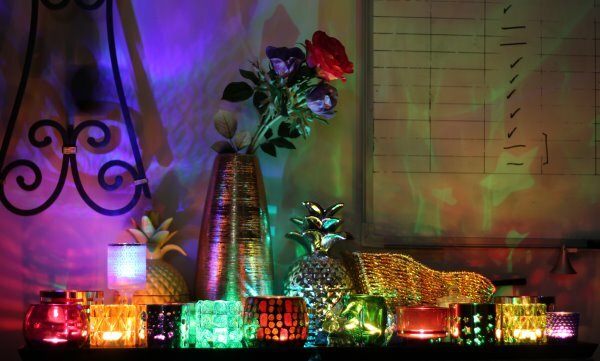 With the new LED tealights I’m going to be able to put on a bigger light show each night without wasting too many candles. 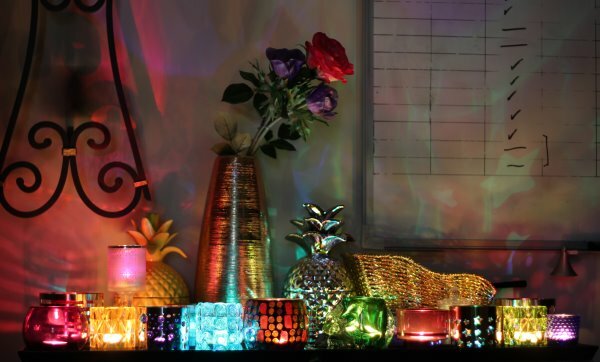 When buying the candle holders I have tried to make sure there is a wide range of colours – there is a green crystal skull, a red and orange mosaic candle holder, yellow, green, pink and purple candle holders. There are also some reflective metal holders with shapes cut into them. 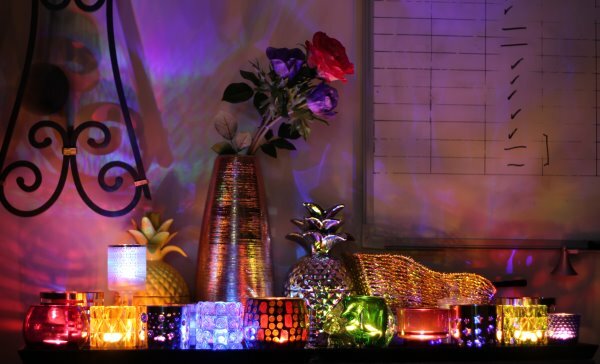 You can see the stars being thrown onto the wall from one of those, which has an LED tea light in it. I was at Kmart doing some wandering while The Other Half had an eye test – turns out he has almost perfect vision, of course! – and I saw these beauties. In past years I never sent Christmas Cards but this year I am more into cards and I will be trying to send one to everyone in the family. I also thought if any of my readers would like a card, I would send them one. If you want a card from Snoskred, drop me your postal address via my contact form, and I will post them out soonest to make sure they arrive by Christmas. 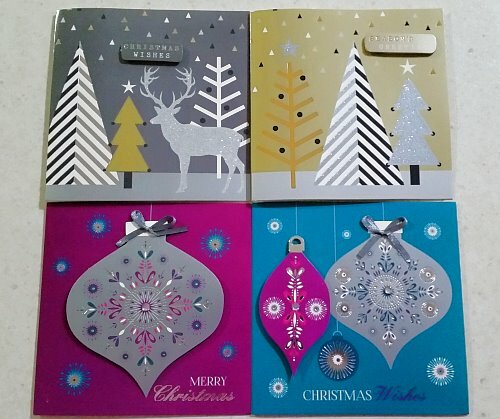 It may not be one of these cards pictured above, I might surprise you with something different, it depends on how many I need to send. You might find another surprise inside, as well. I have to give a big thank you to River for having a succulent garden and making me think I might like to try growing succulents. I have never grown them before. 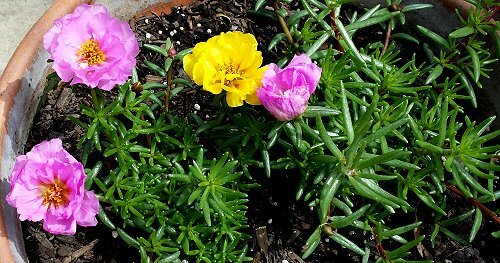 You may recall, I chose some Portulaca. In the photo above you can see how they looked on the 20th of September. 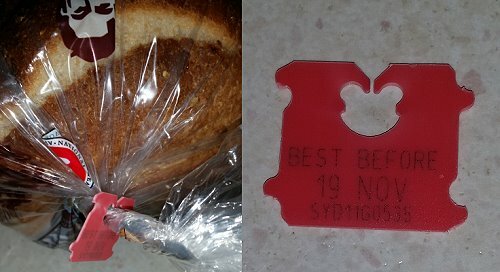 And here they are just one short month later on the 20th of October. They have taken off like mini rockets. I had no idea how much I would enjoy watching their progress. 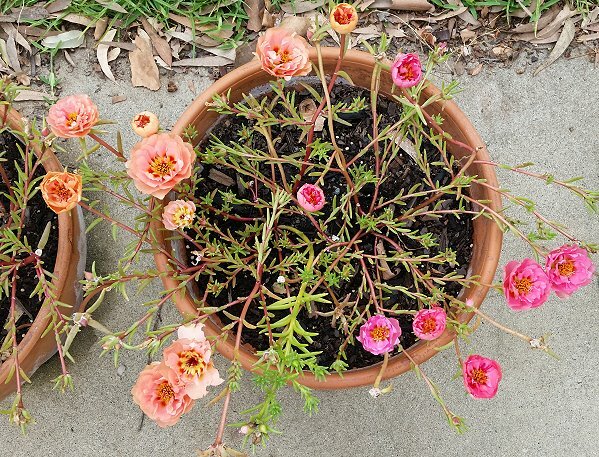 These Portulaca plants have been an absolute revelation for me. Every morning the first thing I do after putting on my glasses is head to the back door to see whether they have any new flowers for me today. You can see two of the plants are reaching out branches to each other.. I do have a routine of watering. 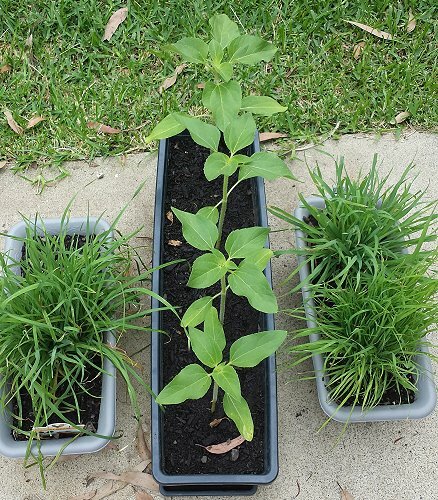 Every second day, I give all the plant pots a good drink of 1 litre of water poured into each pot from some 2 litre milk carton friends I kept and drew a line on. 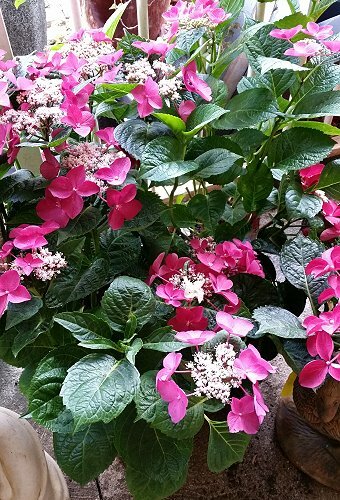 I am very careful not to wet the leaves, just the soil. If it is a hot day, I will usually do this about 3:30pm because around that time it is pretty shady out there thanks to a tree in the right spot. Around 20-30 minutes later, the sun peeks out from behind that tree and things get hot again. On the alternate days, once the sun is on the way down, around 6-7pm, The Other Half waters with a hose – not a long water or a soaking, more like a sprinkle. The flowers are truly gorgeous and there are many different colours. 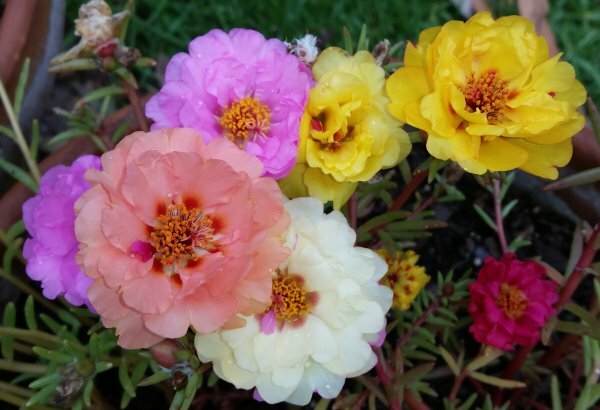 So far a lot of pink, yellow, and two different apricot shades have appeared. I’m sure this plant has many more lovely flowers in store for me this summer. And the Maple Hill Hop. It has rained almost every day this week. 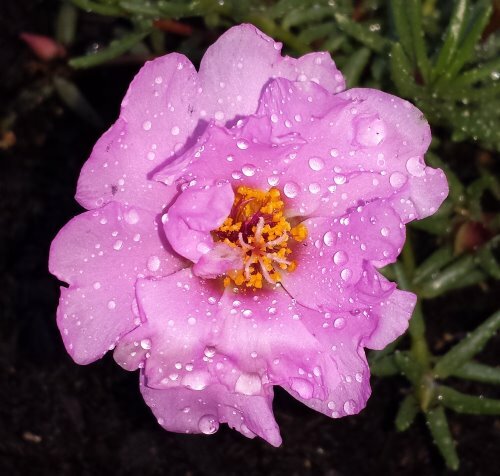 Sadly when it does rain, the portulaca flowers do not open! This has caused many sad moments here. However the chooks are having an absolute blast out there digging for bugs in this weather. 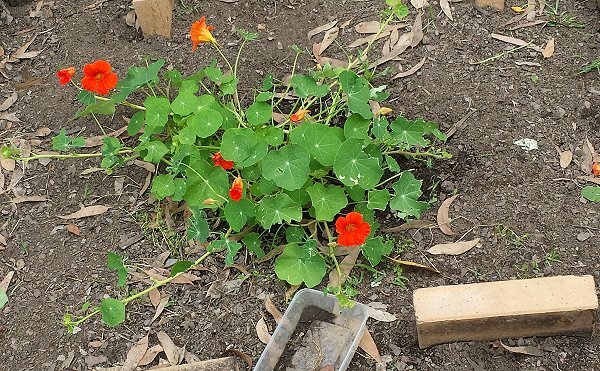 One of the new nasturtiums is very very happy. The other one was looking a little straggly. Then, the chooks found it. More about that below. Chooks love to eat spiders. 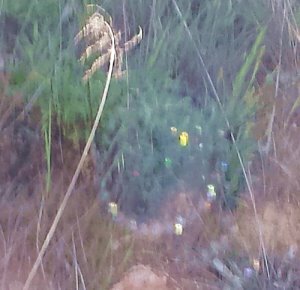 So they have been getting a lot of free range time since we discovered we have funnel web spiders on the property. They do not stop with spiders – they will eat any kind of bug or moving thing. This past week, I saw Rosie chasing a cabbage moth across the yard, jumping into the air trying to catch it. 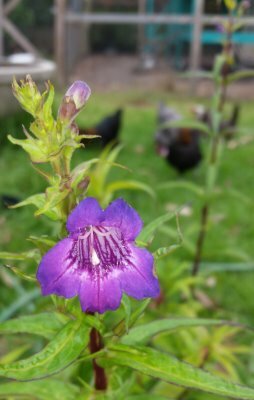 On Thursday my afternoon peace time was interrupted with a lot of trumpeting – when I went out to find out what was going on, one of the girls had a small lizard in her beak and one of the other chooks was chasing her around the yard trying to get it. 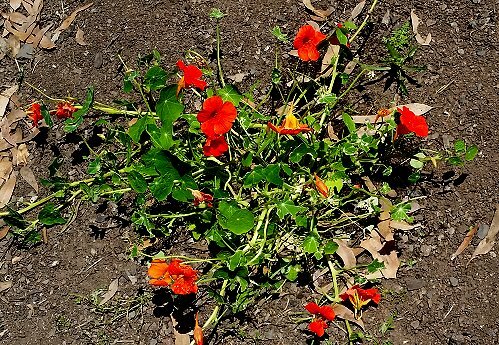 Then they took a fancy to eating one of the new nasturtiums, because it is right next to a spot they love to dustbathe in. That one was looking a little straggly to begin with, now it looks.. bad. That is 10 photos, which is my limit for a post. 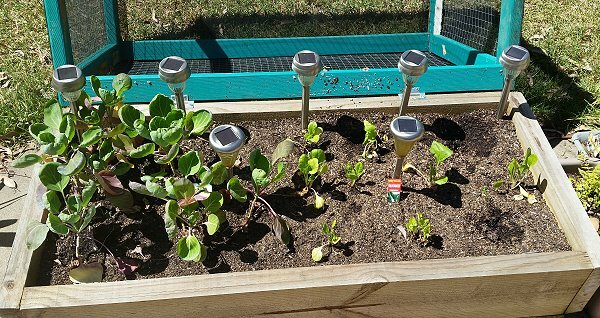 I’ll update you on the planter box with baby spinach, brussel sprouts and silverbeet next month. I’ve been recovering from an injury this week so I have been taking things super easy. You’ll get to read about my injury on Friday this week. I also ordered and received a new phone – the Samsung Galaxy s5. My old phone was struggling a bit to find a signal and the battery lasted less than a day, so it was time to upgrade. Sephy sent me a package as well. When we were in Hawaii in 2013, I bought some antihistamines I had never seen in Australia from Costco which have been fantastic for me, they work really well. I ran out of them right before allergy season started here this year and it is a bad allergy season. Within 2 days of the drugs arriving, I am like a human again! Here are some photos from our Canberra day trip. First up a bit of a photo fail – it may be out of focus and difficult to make out, but that is a reflection of my sparkly watch in the window as we were driving home in the afternoon. 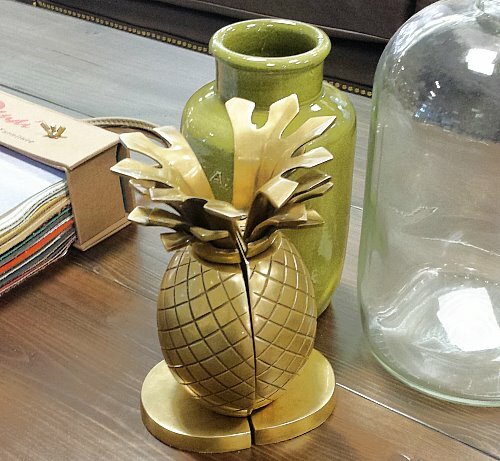 These pineapple bookends would be an awesome addition to my collection, however they were Up Money at $199. A lot of things in this particular store are Up Money. 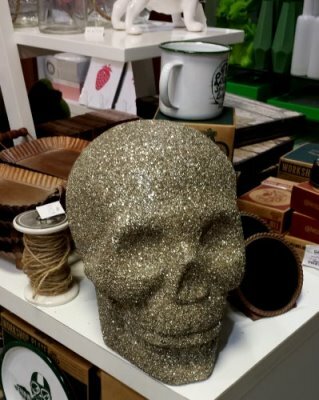 Like this glittery skull for $179. The photo does not give you an idea of the size – we are talking large bowling ball size here. I think I could probably recreate this with papier mache and glitter for considerably less $$. 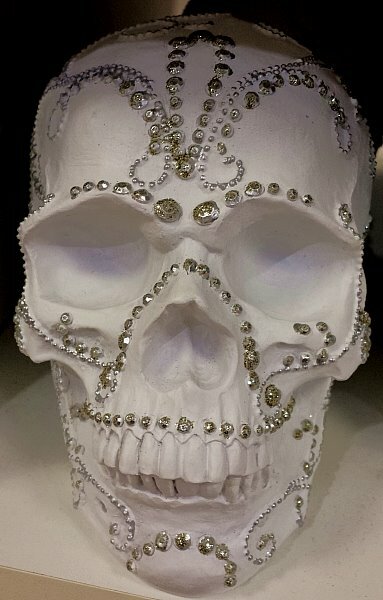 This “diamante” skull was more reasonable at just under $35. It was still fairly large, probably just slightly larger than a real human skull would be. They also had a skull shaped liquid soap dispenser which I exclaimed out loud when I saw it, much to the amusement of a nearby staff member, which made me shy about taking a photo of it. I wish I had, in fact I wish I had bought it! 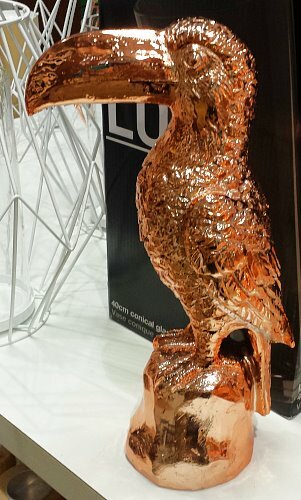 This copper toucan would be amazing on my candle shelf. 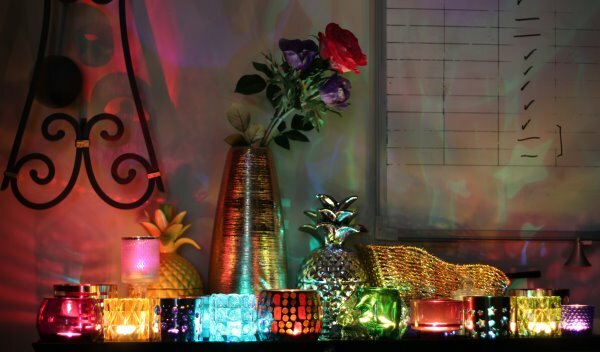 Now that I know how candle light reflects from these kinds of items, I have to refrain from buying All The Things That Look Like This. Copper, Gold, Silver, Bronze, these things are my Kryptonite. After all, my candle shelf is now completely packed with items, there is no room for anything more! 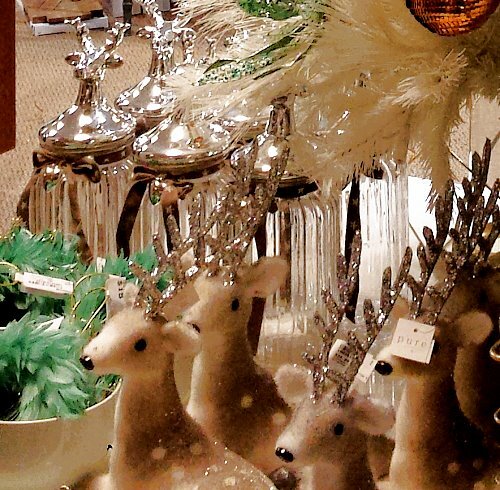 Christmas at this store is also very beautiful. 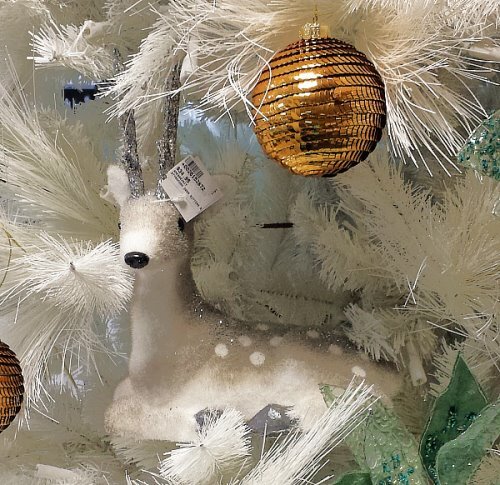 A few years ago they had a white feather Christmas tree which retailed for just under $900. It was a thing of great beauty. Well, it would want to be for that kind of money! Happy Moments for our Grumpy. Friday morning she was returned to the vet for another eye check up. Her eye is almost healed. She will receive eye cream for another week, then nothing more. A not quite so happy moment – on the way there, The Other Half said to me he seemed to have lost the power steering. It turns out the return hose has a crack in it, so that will be difficult to fix. We’ll have to share the Polo until it is fixed. You may recall that The Other Half and I watched Mr Robot together a few months ago and we decided we wanted to keep watching something together.. After the first season finished, we chose 24 which we had never seen before. This turned out to be a terrible mistake. Maybe 7-8 episodes in, we personally wanted to strangle 99% of the characters ourselves, and we would be screaming at the teevee – usually TELL HER or TELL HIM, because the characters on that show had a – wonderful for storylines but terrible for actual people – habit of keeping stuff to themselves! We gave up at the end of the first season, and I suggested that we try watching Breaking Bad, which The Other Half has not seen. We are 7 episodes in and he is enjoying it thus far, plus it is wonderful to *finally* watch it together.